Have you ever wondered which Canadian province or territory has the lowest or highest tax on personal income? 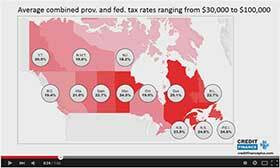 This presentation compares Canada's various tax rates and puts each province/territory on the same scale, showing you how much Canadians pay taxes depending on where they live. This is an abridged version of the full presentation. Most people have a salary where taxes are deducted automatically on a bi-weekly basis and may not necessarily have to manage a budget, like independent workers, freelancers or entrepreneurs, to predict how much is owed to the government. It is still, however, important to have a realistic view of your annual finances and to understand how much is really available after income taxes. An income tax calculator might be handy, also, to anyone with a mobile career looking for a cheaper province to live in Canada. As you will see, the difference between some provinces can be surprising. This calculator is based on the 2017 & 2018 fiscal year numbers (for taxes in spring 2018 or 2019) and uses the official Canadian income tax rates from the Canada Revenue Agency web site for its calculations, along with the Revenu Québec web site for the province of Québec. We plan on updating this calculator every year with the new yearly rates (2019, 2020, etc). As with many types of taxes, the personal income tax in Canada is progressive, which means higher income is taxed at a higher percentage, up to a maximum. These different levels of tax brackets make it a little more complicated to compare provinces, because it all depends on the salary of a person. For example, even though Alberta exceptionally uses a flat rate, which makes it an attractive place for richer people, the majority with an average salary would find British Columbia or Ontario actually more affordable (not including the different cost of living in the equation). Our calculator includes federal tax abatement for the province of Quebec, surtaxes when applicable on provinces such as Ontario, Yukon and Prince Edward Island, and basic personal income tax credit. Don't forget to subtract tax deductible amounts from your annual income, such as your RRSP (Registered Retirement Savings Plan) contribution. Find out how much you save in taxes with your RRSP contributions. This chart shows how much tax is paid for the current income in each province, including the federal tax (adjusted with federal tax abatement in Quebec) and basic personal income tax credit.